When I am out walking in the countryside I always hope to stumble across something which catches my eye and in my view is worth photographing. I always seem to struggle in woodland areas but when I saw this dilapidated woodman’s hut made of corrugated iron it caught my attention. The scene itself was made more interesting by virtue of the large puddle of water which provided some reflections, not only of the shelter but also the spindly trees. The line of stones gave me a good lead in to the hut and I like the overhanging branch which helps to frame the main subject of interest. 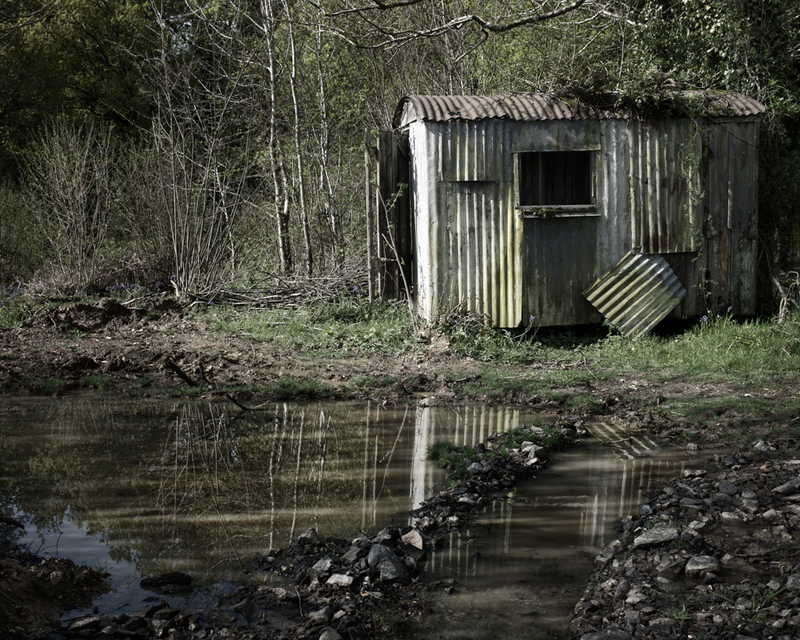 Yes, the hut has seen better days and I would guess has not had a particular purpose in life for quite some time, but photographically speaking this is what makes it all the more interesting – well it does to me anyway. It’s a great shot. I really like it! Thanks very much. Pleased you like it. Thanks Andy. The image has been desaturated, and I blended a mono layer in PS to arrive at the look I wanted. Pleased you sorted your computer issues. All the best Alan. I agree, particularly the ‘torn-off’ flap of corrugated iron on the right hand side….reflecting in the puddle making a long strip of crisscrossing lines on the right hand quarter of the frame (if you know what I mean). I’m a big fan of puddle reflections. Thanks Vicki. I also like the uprights of the saplings which mirror the uprights in the corrugated iron. Without the reflections though, there wasn’t a picture to be had.